Looking for a fun-filled family adventure? 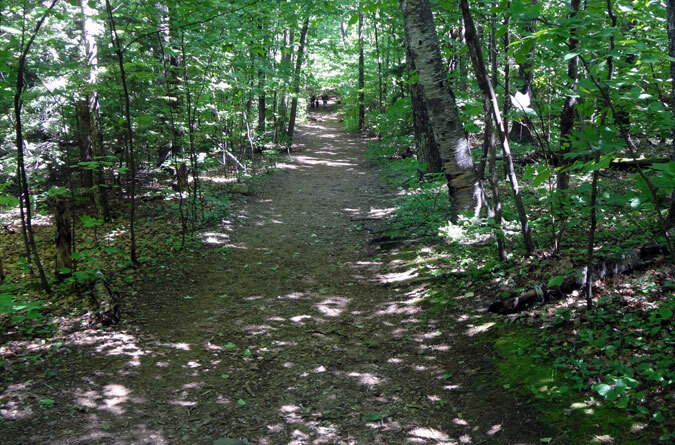 The Old Bridle Path trail on West Rattlesnake Mountain is a short but oh-so-sweet hike for kids of all ages. 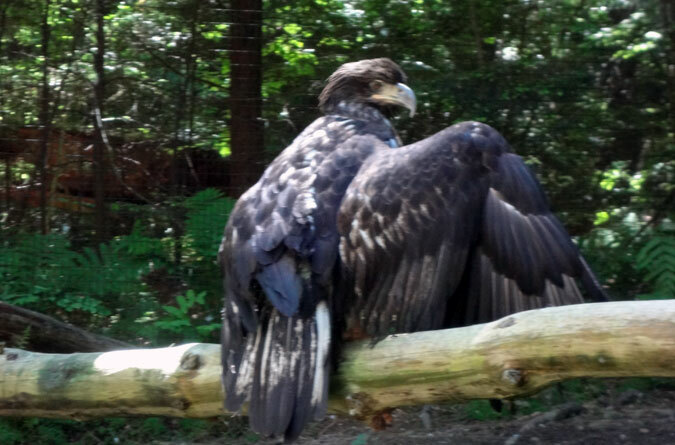 Tag team it with a trip to the Squam Lakes Natural Science Center, home to black bears, mountain lions, bald eagles and many other animals native to New Hampshire, and there won’t be any haggling over bed time…adults included. 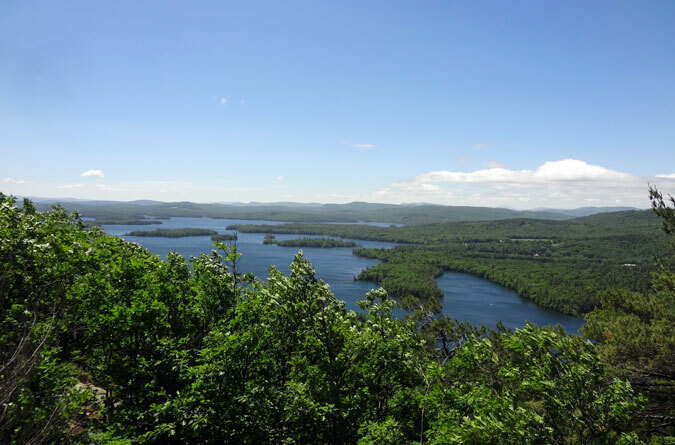 Chances are the kiddos will be most looking forward to the Squam Lakes Science Center visit, so the best bet for trail civility is to start the day with a hike and picnic on West Rattlesnake Mountain in Holderness. The Old Bridle Path Trail is extremely popular so it’s a case where all the trail wear helps make the walk easy for little legs. 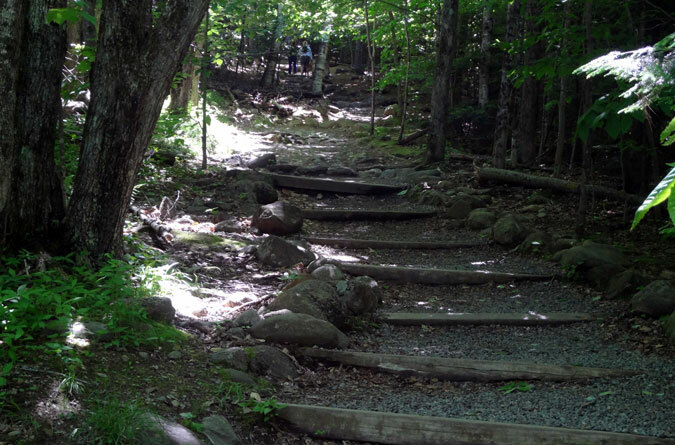 Aside from an occasional rock and a bunch of log steps, which are small enough for children to conquer, the trail is mostly free of roots and other tripping debris. There are a lot of steps on the Old Bridle Path hike, but they’re just right for little legs. With approximately 450 feet in elevation gain on the mile-long trail, the ups are gradual and short lived. There’s also a healthy dosage of flattish terrain to keep the little engines running. Most of the hike occurs in thick hardwood forest, which presents many opportunities to observe nature (there’s a good writeup on the plant life here). We saw several lady slippers on our trek. A short distance before the summit is a scenic lookout on the right side of the trail. The view isn’t much different from that of another lookout just prior to the summit, but it’s still a fun diversion with a large, climbable rock outcropping for older kids. The first viewpoint on the Old Bridle Path shortly before the summit. The view from the first lookout isn’t much different from further up the trail, but who can pass this up? 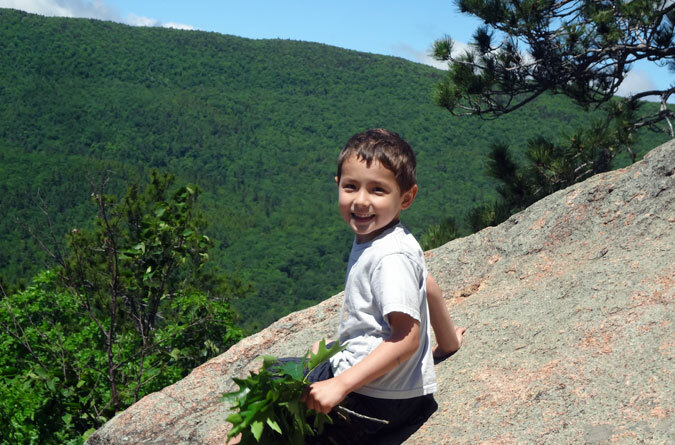 Kids will love climbing the outcropping. It helps to have a leaf sweep to brush away debris. 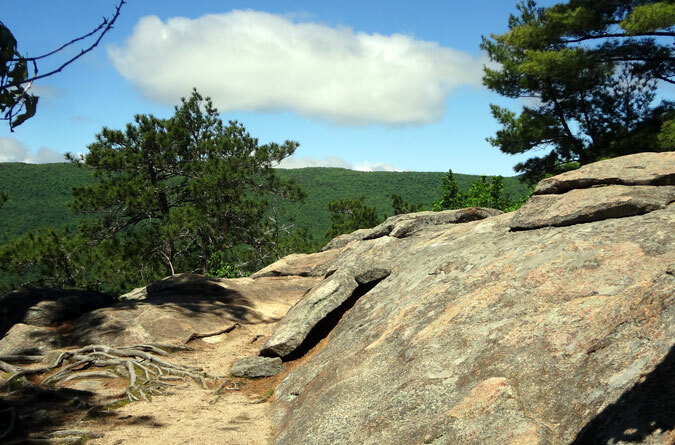 A couple different trails come in near the summit, including the Ridge Trail that splits left from the second outcropping and goes for 0.1 mile to the summit. 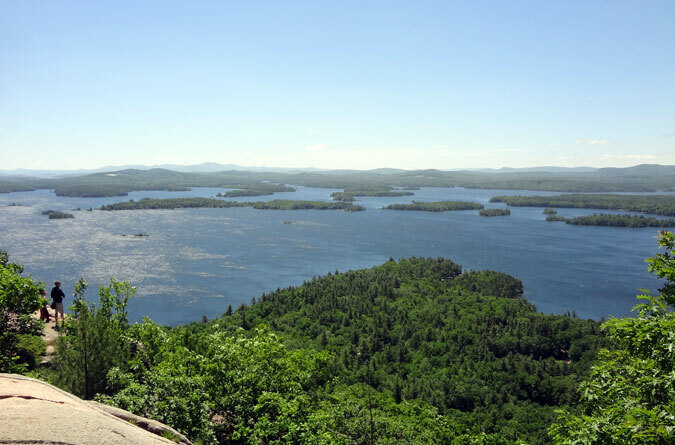 The second viewpoint/rock outcropping serves as the “good enough” summit for most and the best spot for a picnic with magnificent views of Squam Lakes and the many islands that polka dot the landscape. Close enough to the summit to count. Break out the picnic! Get ready for a great time. As the carrot you can dangle for good behavior throughout the morning hike, and at least a couple of days in advance, the Squam Lakes Natural Science Center doesn’t disappoint. There are a variety of nature trails to go along with the animal and educational exhibits, so it’s possible to get a healthy dose of hiking in here alone. Before visiting, New Hampshire residents should check with their local library, as it’s very possible the library will have discount passes available. 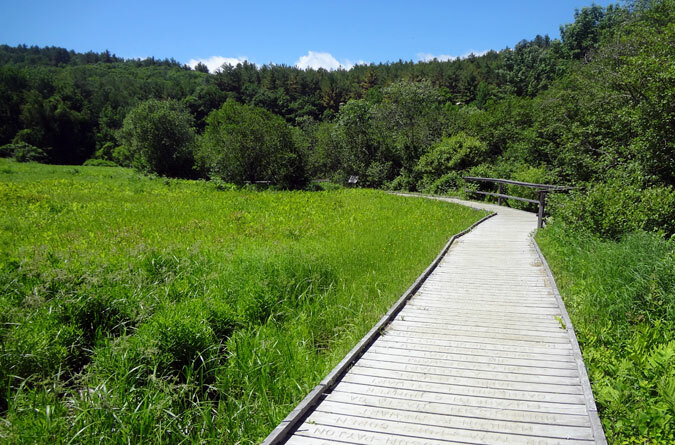 A boardwalk along the main loop trail at the Squam Lakes Natural Science Trail. 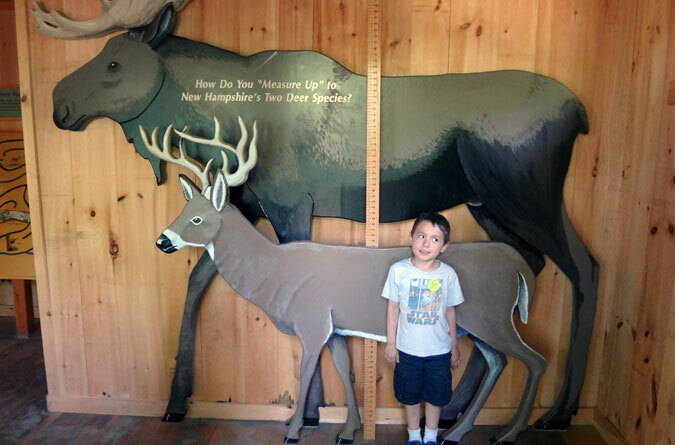 While there are a variety of nature walk opportunities at the Squam Lakes Natural Science Center, there’s a main loop that leads visitors through the educational and animal exhibits. The boardwalk above crosses a wetland where we were able to get a close-up view of a large turtle in its natural habitat. Overall the educational pieces are extremely well done for children of all ages with many hands-on, interactive learning opportunities; kids can learn what it’s like to be a chipmunk by crawling through a tunnel, test their four appendages on a spider’s web, and see how they measure up to a moose and white-tail deer. Growing like a sprout, but not quite white-tail deer height yet. As a very big kid, one of the many things I learned on our visit is that loons migrate to the ocean in the winter. I never knew! I was also very impressed with the animal exhibits. 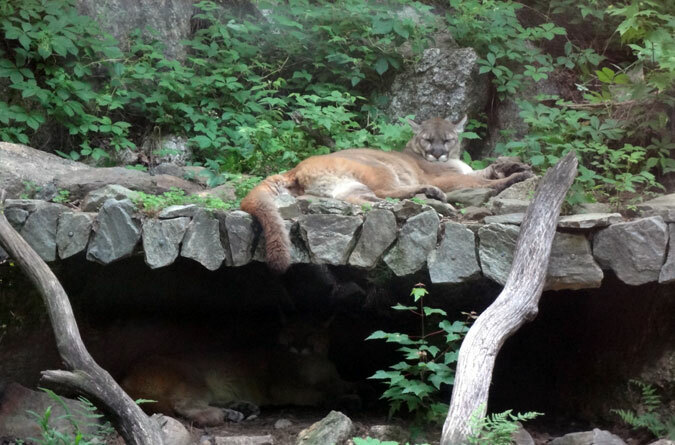 Unlike traditional zoos where the animals are in a cage and often hiding out of view in their “den,” the Squam Lakes exhibits are designed to showcase the creatures in their natural habitats (as close as possible, anyway) and they’re always visible. If there’s an animal you can’t see, keep looking, it’s their natural camouflage doing its duty. 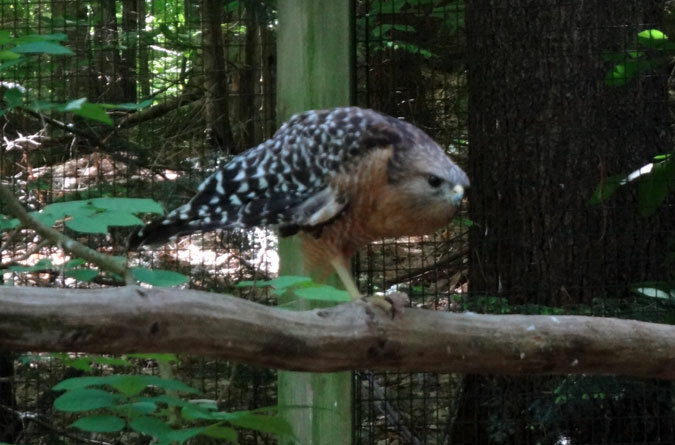 The red-shouldered hawk striking a pose. A young bald eagle stretching its massive wing. On our visit we learned that bald eagles don’t get their white feathers until 4-5 years of age. 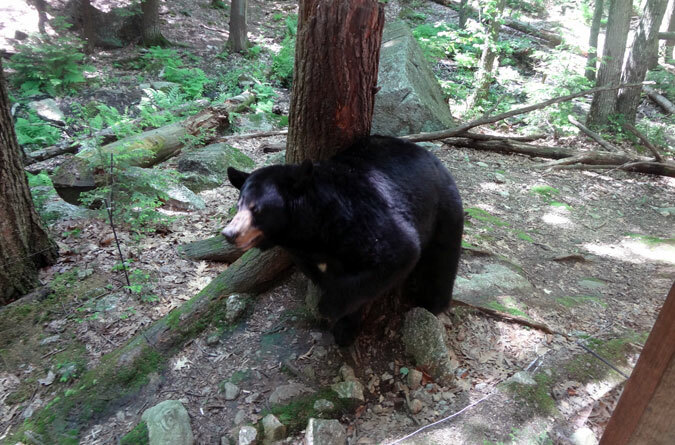 This black bear was busy using a tree trunk as a back scratch. Good thing, too, because I wasn’t about to lend a hand. One of the mountain lions playing it cool. It was hard to say who was watching who. Both the West Rattlesnake hike and the Squam Lakes Science Center are located on Route 113 in Holderness, a short distance from I-93. Take exit 24 on I-93 and follow Route 3 for about four miles to the intersection with Route 113 on the left. From the intersection, Squam Lakes is 200 yards up 113 on the left and the West Rattlesnake parking lot for the Old Bridle Path Trail is 5.5 miles on the right.